The Fall Festivals of Rosh Hashanah, Yom Kippur and Sukkot, the Festival of Nations has fully opened the doors of the future Messianic Era in the fall of 2016. It’s here. Billions of peoples around the world are awaiting with expectation or in fear and shame as the “Era of the Maschiach ben David” (Messiah son of David) is anticipated to come soon. When he comes, it will be as the “Melekh HaMaschiach” (King Messiah) as the “Era of the Messiah” unfolds. Of any time in the last two thousand years, expectations have never been so elevated and poignant since the destruction of Jerusalem and King Herod’s Temple in 70 CE. Now we have come to the end of the epic era, for the “Era of Mankind” is about to be completed. As we search ahead, every International event accumulating around the world will gain a sacred or a prophetic meaning. There are no more coincidences as the G-d of Israel is opening up the “gates of heaven”. What is about to happen in the next few days, months or years into this New Jubilee Era, we can anticipate but have no real clue of what to expect. What we do know is that the world as we know it to be in the last 70 years remains an enigma in front of our lives. The One-G-d of Israel is offering to the Jews in the diaspora a “Land of Peace” and the Lost Ten Tribes of the House of Israel a New Gan Eden (Garden of Eden). This will be the era as the tectonic plates under Mount Moriah will expand to include the entire region of the Land of Israel. This will include the separation of the Mount of Olives, and the resurrection and re-creation of the ancient rivers of Eden. This land will be the recreation of the largest empire of the then known world, the United Kingdom of Kings David and Solomon that including the land on both sides of the Jordan River all the way to the Euphrates River. So It all started on Rosh Hashanah as the Jewish year of 5777 (2017) began. We are on the cusp of entering into the rarified spiritual journey of self-reflection, teshuva with repentance with anticipated change in our lives. Here we can prepare to watch the re-creation of Gan Eden as our future homes sprout across the Levant as the landscape of time converges into the restoration of the “Commonwealth of Yisrael” unfolding in front of our eyes. 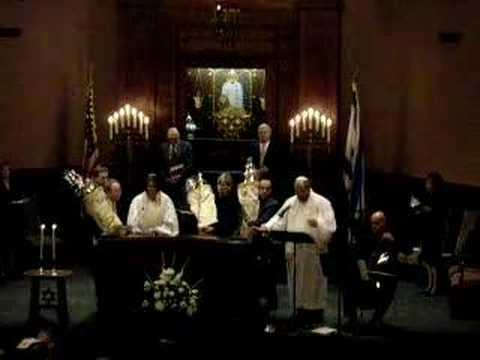 Before that, we must walk humbly before G-d in teshuvah (repentance with change in our lives) for on the eve of Yom Kippur at the Kol Nidre ceremony as the haunting lyrics of the cantor brought out our souls in teshuvah (repentance) as we gave to our Creator our faith in the Sovereign Power as the Almighty One of Israel in emuna (faith). At that time, we recognize that the Holy One of Israel is all powerful and capable of restoring our lives, our earth, and our future life in the World to Come (Olam Habah). Yet, we in teshuvah repent of our lack of faith that HaShem is faithful to all His people and what He has promised in the past eras will be part of the great Divine Tikkun in “repairing the breaches” between ourselves and our G-d.
We will present ourselves to HaShem, our families, friends in the world around each one of us as we are now partners with HaShem, the One-G-d of Israel. Then it will quickly expedite the final days as it cascades over our lives in achishenah, that is quickly and now with many miracles. As the week of the Holy Holidays converged upon us, we awaited our moment of time with our Creator. We tried to purge ourselves of those things that stand between each of us with our Creator G-d of the Universes. We sing, we pray, we open our hearts to the heavenly courts. We will wait in expectation that soon it will be time to jump through the veil that separates us from “our world” (Olam Ha-Zeh) into the higher 4th dimensional life in the Olam Habah (World to Come). Soon we will celebrate that moment of time when during the Festival of Succot, we will be a participant of the global Festival of Thanksgiving, called the Festival for the Nations of the World, or the Festival when HaShem comes down to dwell with man. Did you perceive that our lives have gone full circle in the world around us? We waited for each Sabbatical Week of years in the past to prepare us to meet our Messiah, the Maschiach ben David. He will arrive to bring us to our final redemption of wandering through the wilderness as the Lost Ten Tribes of the House of Israel have done so over the past three and a half millenniums. Destination Yisrael – “The facts of history unfolding in front of our eyes, include also the current military posturing in the “Chess Game” for world dominion. With the end of this Jewish year of 5775 (2016), the 7 Year Shmittah Week of Years has come full cycle, are we willing to testify in the courts in heaven what we saw and perceived to be one of the most massive military buildups of aerial and naval presence in the Middle East by the Top 4 Imperialist nations of the world; America, Europe, Russia and China in seventy years. Then are we willing to testify in the courts in heaven that we did perceive that evil was an illusion, created by the Archangel Sam’ael, and that a new divine reality was unfolding in front of our eyes? Soon there will be the inauguration of the New Torah of Higher Consciousness by the G-d of Israel. This will also inaugurate Metatron, the Meta-archangel known as the “Angel of the Divine Presence” as “King Messiah” (Melekh HaMaschiach). The first thing we must ask, who is in control of our Universe? Are our lives a series of coincidences and happenstances or do we have the “emuna” faith in El Shaddai” the Almighty One of Israel that He and He alone has the Sovereign power to fulfill or to terminate as He chooses to be. If we sit back and look at the incredible changes of our Planet Earth as we are now being swept up into a cycles of war, we have to conceive that either HaShem, the G-d of Israel has lost sovereign control over Planet Earth, or that we are today, the participants of a greater universal struggle; the struggle between the powers of darkness under the satanic influence of Sama’el against the forces of HaShem’s forces of light. At this time Michael, the guardian Archangel of the Jews and Israel will be fighting for the survival of the State of Israel while Meta-force of Metatron, the Meta-Archangel who is the Commander of the L-rd’s hosts at the time of Yehoshua (Joshua) at the Battle of Jericho will be fighting for the control of Planet Earth. Yet this was also the Angel at the Burning Bush who gave Moses his “military commanding orders” to direct the Great Exodus of the Hebrew Israelites out of the oppressive Empire of Egypt, who was also known also as the “Angel before the Face or the Divine Presence of G-d.” From the writings of the sages of Judah, Metatron will become the future King Messiah (Melekh HaMaschiach). As we take note in the Divine Emanations of G-d streaming down from the World of the Divine, there is no ruler on Planet Earth that is here without the will of the Almighty One of Israel. At the top of the Sefirot is the Keter (Kether or “Crown) the Source of all life. At the bottom of the Sefirot is the Malchut (Malkuth), the Kingdom of G-d on Planet Earth, the earth upon which we live today. To begin to understand how the G-d of Israel rules the universe, we must first understand and concede that all source of life comes from the Throne of G-d known as the Keter, and ends at the Malkuth, called the Shekinah. This is where 4-dimensional life touches 3-dimensional life. Eventually the gate-way to Gan Eden (restored Garden of Eden) will soon come down to Planet Earth. At this time, the heavenly Gan Eden will reach down and touch its earthly counterpart on the very spot where the future Shekinah will soon dwell over the Foundation Stone on the Temple Mount where the Creation of Planet Earth all began so many millenniums ago. We must also understand that there was a far greater reality that was created during the “Seven Primordial Days of Creation”. These include a hundred billion galaxies, that encompass a hundred billion suns and encompass also a billion, trillion infinite spiritual worlds, universes and dimensions guided and directed by the Light of the Ain Sof, the One-G-d of Israel. The most amazing fact is that this transition zone called the “redemption and restoration of Klal Yisrael” is the sum total of the convergence and reunion of “All 12-Tribed Israel”. The Festival of Sukkot; the Festival of the Nations and the Festival of Dwelling when HaShem will come and dwell with His people. Tens of thousands of Israelis and tourists, in particular Christian pilgrims, march through Jerusalem’s streets in support of Israel. The Festival of Sukkot literally means booths. This refers to the temporary dwellings that the ancient Israelites literally camped outside for 40 years in the wilderness while living in temporary dwellings. The modern sukkah includes a thatched roof so that one could see the starry sky above and meditate upon the Divine. During these seven days, Jewish families lived in these booths, which are usually built in a garden or on a balcony, in the memory of the ancient Israelites' life of wandering in the wilderness for 40 years in temporary housing structures. 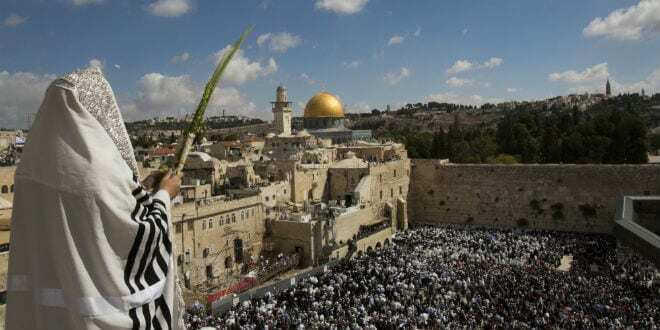 In a powerful display of the glory that once radiated from the Solomon’s Temple, on this Sukkot in the Jewish Year of 5777, it was the ending of the Fall Festivals of G-d that was also the beginning of the next Jubilee cycle. There at the Kotel, 50,000 people went to be the participants of the priestly blessing that once again affirmed their dedicating to Jerusalem; HaShem’s Zion and Holy City. At the time of the priestly blessing, on October 19, 2016, the Jewish Kohanim covered themselves with their own prayer shawls and with the liturgical raising of their hands, they blessed the land of Israel. Jewish worshippers wave the Lulav and Etrog in front of the Western Wall, Judaism’s holiest prayer site, in Jerusalem’s Old City of David. This Jewish festival has been celebrated from time memorial to commemorate the 40-year period during which the Israelites lived in structures like these temporary booths. Nowadays several people use palm tree branches and leaves to make the structures. As you can see the interiors of these booths are decorated with the Four Species – four plants mentioned in the Torah. These “Four Species” are the (1) citrus etrog fruit, a (2) lulav palm to wave, (3) a brava that is a form of a willow branch plus a (4) a hadass which are leafy boughs from the myrtle tree. Then the Sukkah's are also decorated on the interior with fruits and vegetables. On the 8th day, the faith celebrants as they conclude their celebration from the nations of the world, it was then time for the Jewish people to participate in Simchat Torah. They dance with the Torah, as the living representation of the presence of HaShem in our lives. So we have come full circle throughout the past 12 months. Have you been watching with expectation for the redemption of all mankind? Have you noticed the collapse of all social order and all morals in our American culture? Here in the 17th and 18th century, the descendants of the Lost Ten Tribes of the House of Israel created and built along the Atlantic coastline of North America the 13 Original Colonies representing all 12 Tribed Israel plus a 13th colony that represented the added blessing of the Patriarch Jacob to the two sons of the Egyptian Viser Joseph; Ephraim and Manasseh. Now in the beginnings of the 20th century, the descendants of the Lost Ten Tribes are poised to become a part of the “Third Great Awakening” as 12-Tribed Israel will be redeemed and restored back into fellowship with their cousins the Jews. The “Nation of Israel” that was created by the G-d of Israel at the mount called Sinai will now again become “One Nation”. Did you actually believe in your heart that the culture of America and Europe could deteriorate as much as it has done in past year? Are you preparing your life to become part of the redemption of the Lost Ten Tribes of the House of Israel? The Feast of the Rejoicing of the Law, called Simchat Torah looks now into our future, as we all rejoice and celebrate the centuries long yearnings to once again become whole again as “One Peoples”. What a rejoicing it will be as we are united again as the “Nation of Israel” and will now be reunited again as the One-G-d of Israel opens wide the gates of heaven and promises to “come down” and dwell with his “chosen people”. HaShem, the One-G-d of Israel is preparing to transform our lives. We have now entered into a New Jubilee cycle. On the 8th Week of the Sabbatical Week of Years, the expectation of the Messiah will continue to elevate our lives for the G-d of Israel is faithful to save His own people. “Kol Ha Tor Vision”, the Voice of the Turtledove. Memories of Succot: It began with a Blood Moon and Ended with Rejoicing for the Rain on Hoshana Rabbah.